The Cathedral of St. Andrew in Grand Rapids. The Evangelical Choral Society is a severely underrated musical gemster in Grand Rapids, Michigan, and you, the public, can turn that around. You'll love this choir. It's filled with heart and technical skill. As they belt out the classics, the group will twist up your music-loving guts and knock your (probably) Argyle socks off. On Saturday, my dear husband, precious sister and I were blessed to attend the group's semi-annual public performance. 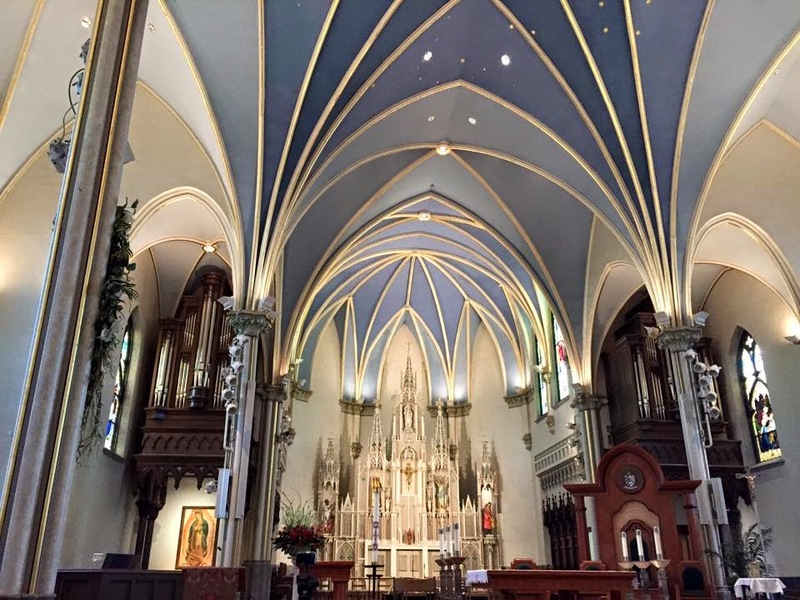 This spring's concert was held at the Cathedral of St. Andrew — the Grand Rapids Catholic Diocese headquarters. Besides being an obscenely lovely building that's about to celebrate its 140th birthday, the cathedral, as noted by music director and diocese organist Nick Palmer, who welcomed the audience on Saturday, is perfectly acoustically designed to radically majestify the beauty of choral music. That's a paraphrase. The church often hosts community concerts, not just sacred music but also opera and whatknot, which I think is a wonderful outreach. Brava, St. Andrew's! You brothers and sisters got it. And when you got it, flaunt it. Randall Wm. Burghart addresses the audience between songs. Saturday's concert, led by the group's esteemed conductor and music director, Randall Wm. "Randy" Burghart, featured three works in German, one in Latin and three in English, and two outstanding sopranos: Kristen Burghart (Randy's awesome classically trained singer-chef-cool person-wife, whose voice you local folks might recognize from Opera GR performances), and Mary Lehr Dean, whom I hadn't seen perform with the group before, but found to be an impressive talent whose high notes could probably break glass. But not the glass at St. Andrew's, because it was recently reinforced. The program was about evenly split between classic and modern works: Johannes Brahms, Felix Mendelssohn and Georg Schumann, balanced with Chilcott, David Cherwien and a spiritual by the late Moses Hogan. I'm glad Burghart invited his longtime musical collaborator Bethany Schutter, an alto singer and Hudsonville High School voice instructor, to conduct one of the songs, the spiritual by Moses Hogan, "Deep River." This is a favorite piece for me and my fellow pianist sister, Marissa, ever since we learned to play an arrangement of it years and years ago on keys. We were delighted to hear it performed a capella. The keyboard is no match for the agonizing so-good-it-hurts bazinga of a spiritual. The closing performance was an 11-minute, beautiful, nuanced and expertly honed rendition of Felix Mendelssohn's "Hear My Prayer," the evening's only piece with organ accompaniment, as performed by St. Andrew's Nick Palmer. His pipe organ rocks the friggin' casbah. "Hear My Prayer" was soprano Kristen Burghart's chance to shine, and she stepped up and delivered the goods, as she invariably does. Watch to see if you can catch her not-so-covert glances in this stunning video of the finale, "Hear My Prayer." Regarding the caliber of the show as a whole, I foresee the cathedral taking up a collection for roof repairs, because the music raised the rafters off their hinges and slammed them back down again. Mylanta! 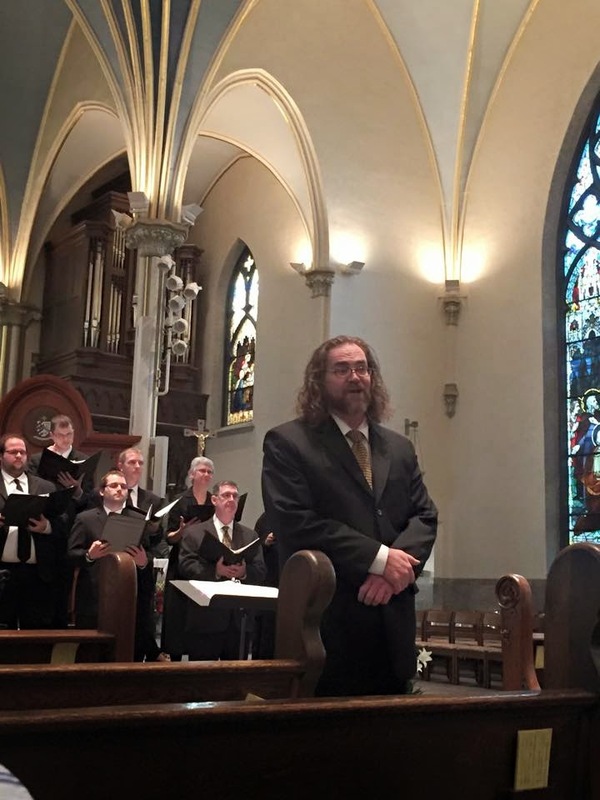 The Evangelical Choral Society, a nonprofit 501(c)3 organization, performs free concerts twice yearly: once in the spring and again in the fall. The fall 2015 concert will be held the Sunday before Thanksgiving at First (Park) Congregational Church, 10 E. Park Place NE in downtown Grand Rapids. As an added bonus, at that concert, ECS will be performing with a full orchestra. (Squee!) To learn more, visit www.ecs-gr.org, or "Like" their Facebook page. Note: I am, as you might have noticed from my inexcusably familiar remarks, acquainted with the Burgharts, owing to our mutual Cornerstone University ties. I was not, however, in any way paid or goaded into writing this review. So when you donate your moolah on the ECS website, and please do, you need not fret that the money will be mismanaged on dubious propaganda campaigns that involve hiring this cornball reviewer. I can't however, promise not to review their music again. Because they are my kryptonite. Peace out, homies.